Providing you the best range of painting stand with effective & timely delivery. Package Includes 1 x Easel -1 x black Fixing Bar -1 x black Nylon Bag. Techtest has selected the comprehensive range of artists' easels to make up a range of essential items to ensure that our customers have all they need to get started. Choosing an easel is an important decision for any artist. The choice will vary according to the artist's style, preferred media and quite often availability of space. Aluminum and metal easels are a good option for the artist that wants a lighter weight, and often more portable, alternative to bulky Display wooden easels. Our range of fine quality aluminum and metal artist Display easels ensures that we meet the specific needs and requirements of any artist, while providing firm support and long lasting service. 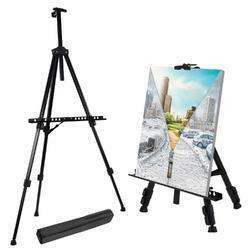 Techtest Artists Portable Lightweight Metal Display Easel is the most used portable aluminum easel ever made for any travelling artist, constructed of lightweight aluminium, offers one touch control for quick telescopic leg adjustment and complete with its own weatherproof carry case. It the perfect answer for travel and fold down small enough to be an excellent table Display easel too. It holds canvases from 15" to 32" in height and most widths, while the Display easel itself can fold to a convenient 22" size for easy transport. Looking for Painting stand ?